I failed my children by not pushing them further in studying spelling and vocabulary. One of my sons, a senior in high school, said to me that he just doesn’t know very many words. His limited repertoire made writing essays for his college applications a difficult and grueling process. Writing never came easily to him. In contrast, I’ve always loved penning my thoughts and studying the mechanics of grammar, selecting the right words to convey my meaning. I love playing Boggle and Scrabble, and I look forward to quizzing myself with Reader’s Digest’s “Word Power.” I stop myself from giving my son too much writing advice because it’s important that he express his own thoughts in his own way. In looking back at the differences in our educations, I have an idea of why he struggles more than I do. My elementary and junior high schools encouraged participation in spelling bees. I spent hours on rote memorization with the help of my patient mom. She read pages full of words out loud to me, one word at a time. I never once thought to ask her what the origin of an unfamiliar word was, but today’s top spelling bee contestants frequently make use of that rather sophisticated technique. If I had known there was more to studying spelling than memorization, I might not have lost first place to Kathy Trotter in the sixth grade. I didn’t know how to spell curry. Rote memorization only got me so far. Fortunately, I wasn’t competing for a college scholarship. The short-term goal was simply praise, a dictionary, and a trophy. The lifetime benefit was that I became a good speller. 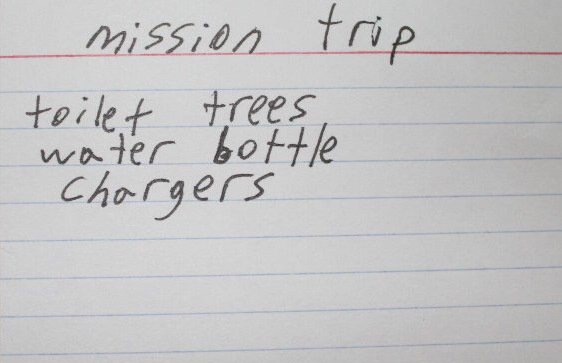 Spelling and vocabulary matter: I had to let my son know that toiletries would be easier to pack. Sixth grade for my children was a different experience. Their spelling words were taken from their own journal entries. The children were tested on words which they individually used in their own writing exercises. I understood the practicality of holding students responsible for using self-selected words correctly. But I wanted a bigger challenge for my kids. How would they learn new and unfamiliar words and to expand their knowledge of language? I reminded myself that teachers aren’t solely or primarily responsible for our children’s educations. As parents, we need to instruct and guide. To complement my children’s elementary school lessons, I developed a game that I thought would challenge them and be fun for our entire family. During one week, I randomly selected a word each day from our two-volume dictionary. By the end of the week, we all had to know how to spell the seven chosen words and combine them into one sentence. The sentence could be longer than seven words, but it had to reflect correct usage and meaning. Essentially, the family and I studied a word a day—similar in scope to what Merriam-Webster currently offers online—but my game involved the added challenge I was seeking. So that you can see how this game worked, I’m going to borrow the seven “Word of The Day” selections which Merriam-Webster promoted from October 29 – November 4, 2015. First, we have to consider the definitions of the words. The list below is taken verbatim from www.merriam-webster.com. My ruddy confidant was caught in a microburst which left her so trepid that, when she couldn’t describe the situation in a pellucid manner, I was underwhelmed, despite her apparently ebullient experience. 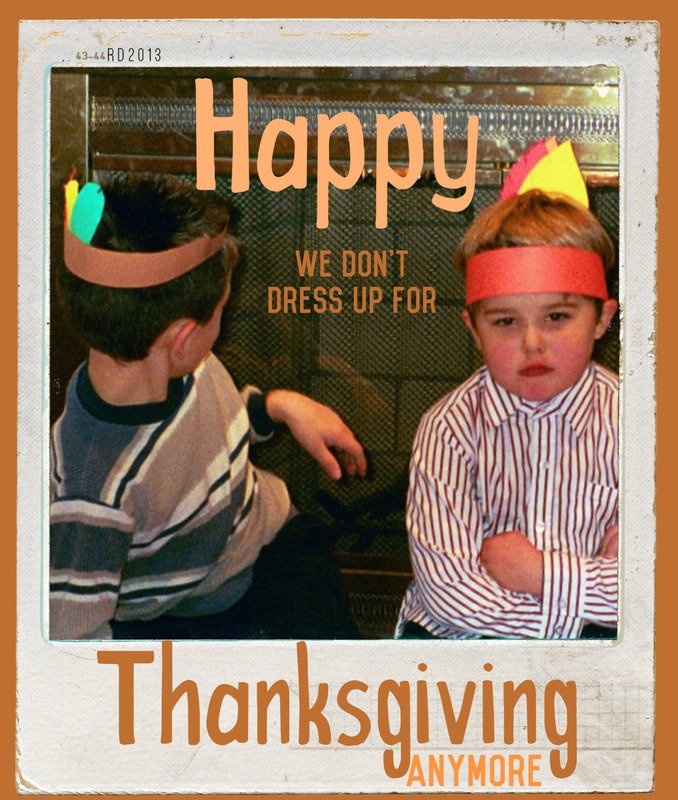 If I wanted to break the rules of grammar when creating this meme, I would have written Happy Givingthanks. Sadly, my kids never really enjoyed the game as much as I did, and it was quickly forgotten. But thank goodness, they now have smart phones and can share highly entertaining, often grammatically incorrect, internet memes with one another. If only people like my kids understood the rules before they broke them. After reading your story plus a few others recently off the internet, I’m surprised that memorization seems to get such short shrift in schools today. While creativity is important, swift recall is just as necessary for problem solving. Sorry I missed your comment, Sue. I’m sure that teachers do work memorization into their lessons in ways that make sense. Spelling just happens to be one that I personally don’t like to see compromised. I’m glad you’re back with us in the land of technology and that you liked the story. We all love you too. “Toilet trees” brought a smile to my morning. I agree the majority of students are short-changed on vocabulary, spelling and grammar. My son has a great vocabulary achieved with his own personal reading and not from school. My son will be glad to know that, despite his embarrassment, he’s making people smile. I should let everyone know how proud I am of him and all my kids. No matter how funny or frustrating certain moments were, each of my children achieved academic honors all throughout junior high and high school. I’m one blessed mom. Funny, thanks for sharing. Word play, as opposed to word study, is one of the few things you can do with voice alone. Along with tell stories. During revisions, I strike words that don’t reflect my own voice. I try to find all of them, but other personalities sometimes sneak into my writing. Which leads me to wonder: who am I, really? Hopefully you don’t use some of those words in your writing. I’d need a dictionary or Siri to know what you were writing. Yibbity, Your comment reminds me that writers need to consider their audience and then tailor carefully selected words that will engage and not frustrate their readers. Rest assured, I’m no brainiac. You won’t normally find me using words like those I used in my example.